Ankur Mehta, a UC Berkeley Ph.D candidate, will be facilitating the first day-long Berkeley Mystery Hunt across campus, which will incorporate problem-solving. In his spare time, UC Berkeley Ph.D. candidate Ankur Mehta breathes fire, salsa dances and plays African drums. Saturday, he will be facilitating the first day-long Berkeley Mystery Hunt across campus, where he and a group of four other organizers have been planning on and off for about a year and a half. The hunt is a puzzle-solving competition that will incorporate several different types of problem solving - including word problems, popular culture quizzes and number games - in order to find a hidden object somewhere on campus. The hunt follows a backstory in which the organizers are trying to find a solution to the campus's financial troubles that can only be found by solving every puzzle. Mehta, who wrote most of the puzzles himself, said because the hunt includes a wide variety of puzzles, no particular major will be at an advantage. "Ankur has basically been the driving force behind getting this going," said organizer and physical chemistry graduate student Annelise Beck in an email. "He wrote most of the puzzles and has been in charge of getting everyone together to plan things out." The organizers are expecting about 15 teams at the hunt, which according to Beck, may draw about 150 participants. Mehta said he was inspired to introduce the hunt to this campus after participating in the MIT Mystery Hunt, which he said is often a big draw for alumni. However, while the MIT hunt is spread out over the course of three days, the UC Berkeley hunt will last only 12 hours - beginning at 10 a.m. on Saturday, which Beck said will make the time commitment more manageable. 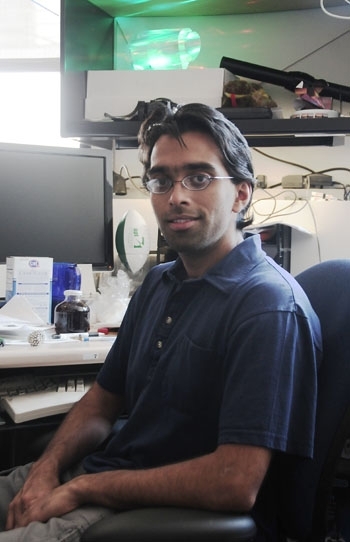 Mehta, a former participant on the reality show "Beauty and the Geek" in 2006, received his undergraduate and master's degrees at MIT by the age of 20 before coming to UC Berkeley in 2004. "MIT is a very tech-heavy school," he said. "Here, some of my closest friends are architects, film majors or Japanese studies majors, which you don't get much of at MIT." While problem solving is one of Mehta's passions, his list of hobbies also includes performance and social dancing, climbing trees and playing volleyball or frisbee around campus. Because he is currently not taking classes and instead working on research for his Ph.D., Mehta said he is free to leave the office periodically to take adventures around campus. "I just live in the moment - whatever's the most fun thing in the moment, I try to do," he said. "I try to enjoy life and have as many different experiences as I can." Nupur Garg, a medical student at Yale University, said in an email that Mehta taught her how to breathe fire. She said she has known him for eight years, since she was a freshman and he was in the master's program at MIT. "Let's just say he's probably had more adventures/experiences in his life than any other student on your campus," she said in the email. After the puzzle hunt is over, Mehta said he may continue work on designing a board game, admitting that he never has one single project going on at one time. He said he can instead divide his time between research for his doctoral project - a flying helicopter controlled by autopilot - and participating in different activities such as the puzzle hunt. "The thing is, I'm interested in pretty much every field there is," he said. "If I ever find that one passion that I like above all, that's when I'll graduate and go pursue that."